Blog What Has 16 Motors, a Pilates Ball, and Flies? 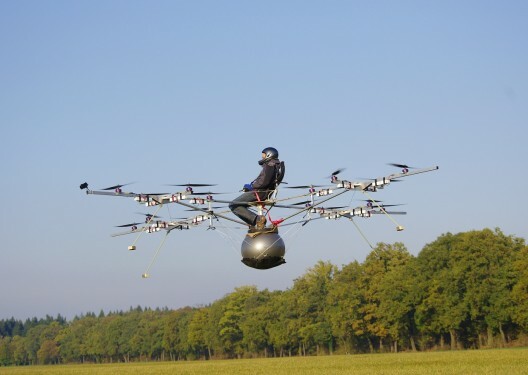 Your editor would rest easier at night knowing that the intrepid test pilot of this stalky creation were strapped onto a proper seat with a proper restraint system, but the current impromptu nature of keeping the operator out of the multiple twirling blades has worked – so far. Despite its gangly, random appearance, the E-Volo is not just tossed together. The 16 Hacker motors (editor’s best guess – or they might be budget Asian copies), controllers, and large diameter propellers need to be modulated with great finesse to maintain level flight, and that suggests a sophisticated control system, as designed by Stephan Wolf underlying the design. It must work exceedingly well, since pilot Thomas Senkel reported that, “The flight characteristics are good natured. Without any steering input it would just hover there on the spot”. 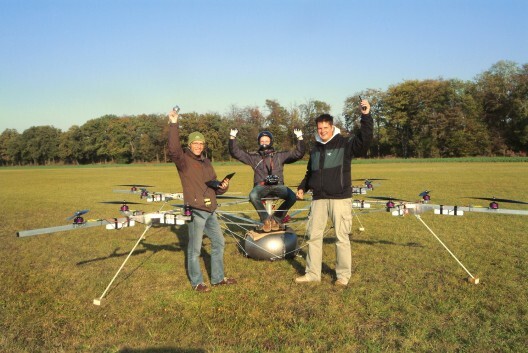 The 80 kilogram (176 pound) device can “land safely” with 12 motors running, indicating that it might be able to remain aloft with three motors defunct. 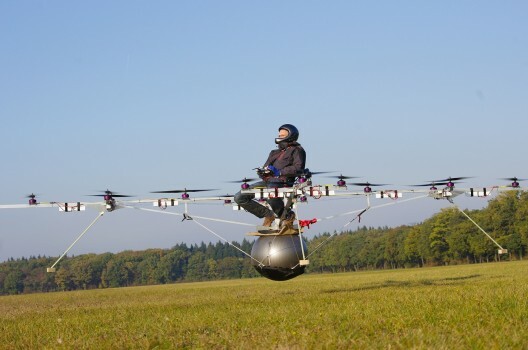 Design studies by Philipp Halisch show a far more “finished” look and a portability that would allow the multicopter to be folded, transported, and re-rigged for flight. These studies include enclosures for the 12-to-16 propellers and a more secure perch for the pilot. He sees the E-Volo as an aternative form of urban transport. The company’s vision statement proclaims, “We will soon sell e-multicopters,” explaining that, “In the next few years we would like to make more of these simple-to-fly devices available at an affordable price. The flyability of this device, the simple and straight-forward piloting making the possibility of flight available to the average person is a goal that we strive towards. “The motors as well as control systems will be continuously worked on and developed to allow for extended flight time as well as a more efficient usage of available onboard energy. “Software regarding the 3D obstruction mapping will be improved. “Coming from an ultralight background, safety is written large in our books. Safety in flight will be developed with multiple concepts being hashed out and [conceptualized] for everyday use. “Optimization of energy usage in charging and durability in battery life is currently one of the largest problems in electrically powered transportation. The future is bright for the battery industry; as such we will strive to keep the newest and best available technology in our electrically powered devices. “A hybrid concept is in the works using a generated system be it gas, or other more efficient methods to power the device in flight. With a virtually viral video hitting the 621,000 views mark in one week on YouTube, Alexander Zosel, responsible for marketing, sales, and public relations, must be feeling particularly good about the success of the flight and its growing public involvement. As noted, all team members are involved with ultralight flight, and their endeavor certainly opens up new possibilities for vertical takeoffs and landings. It will be interesting to see what their idea of “an affordable price” is for this fledgling design.